If you were thinking about quickly spicing up your Android device, without the need for root or custom ROMs/themes, then revamping your lockscreen with a simple app is a good place to start. Recently launched is Sparky, a lockscreen app that brings preset themes that actually look good right to your device. From what I can tell, this removes all types of lockscreen security (example: no passwords, pattern unlocks), but if that isn’t something you are concerned about, it’s a cool app. 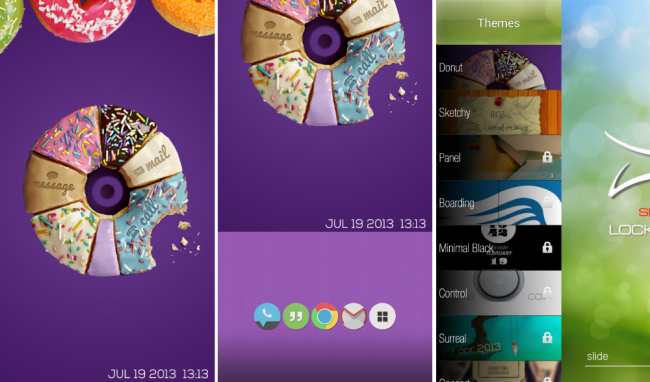 The free version comes with two themes, but for $2, the full version gives you a very healthy selection of themes. Surprisingly enough, the purple donut theme already went well with my wallpaper and icon choice though, so I will stick with that. Each theme lists missed calls and text, so they also add a bit of productivity as well. Go check it out on Google Play by following the via links down below.